Marten Joseph Brandel is a jerk; takes one hell of a photo. Go to jail. Go directly to jail. Do not pass go. Do not hang any gay people on the way. SANTA ANA (KTLA) — A parolee is under arrest after allegedly admitting to hanging a noose at a local gay rights organization last October. 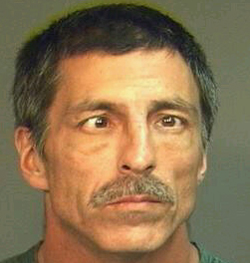 Marten Joseph Brandel, 45, was arrested on suspicion of committing a hate crime and hanging a noose on private property when he showed up for a meeting with his parole officer in Irvine Friday, according to Sgt. Anthony Bertagna of Santa Ana PD. A noose was found hanging on the front door of Equality California’s Santa Ana headquarters on October 29, 2010. Bertagna said DNA on the noose matched samples already in the state system from Brandel, a transient with previous arrests ranging from drug possession to assaulting an officer as well as other property crimes.